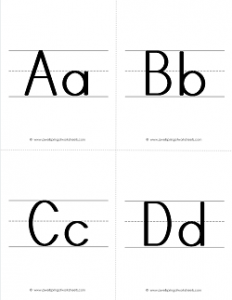 Want some abc flashcards with the letters printed in just the right thickness on primary writing lines? You’ve never thought of those exact descriptions before, but none the less here they are! Ta!Da! These flashcards have the upper case and lower case letters on the same card printed just the way the kids should write them – they touch the top line, mid line and baseline where needed; the lines are crisp and straight; and the letters are nicely spaced next to each other. A great resource when you get into letter writing skills or even when you first introduce the letters. 7 pages with 26 flash cards.